When you’re looking for good lighting for your garden but don’t have the outdoor outlets, a very dependable options are the solar lights. If this is the very first time when you’re hearing about the matter, going through some basics and tips is going to be more than helpful. How do they work anyway? The photovoltaic cells take in the sunlight during the day in order to charge the batteries and they light up the bulbs later, during the night. Placing the solar lights is essential and you must place them in areas with full sun exposure, for more than 8 hours the day. The larger the surface of the cells, the easier and faster the batteries are charging, giving you more light during the night. It’s completely normal to ask yourself if the solar lights are going to work in an area with poor sun light. Even though it’s not as easy as in a desert area, you may still install solar lights even in a fully shaded area. Don’t hesitate to ask for help from a landscape lighting pro that may position better the photovoltaic panel on your roof and wire it to the lights in the shady area afterwards. And guess what? Even there isn’t much sunlight isn’t to be gathered, the solar lights are still going to light, even though they’re not going to be the brightest option. Is there more than just one type of solar lights? First thing to think about when shopping for solar lights is to give a thought about where you’re going to install them and why you’re installing them in the first place. You may want to use solar lights for security reasons-in which case you should go with bright types, featuring motion sensors, or for decorative reasons- in this case some less bright lights, subtle may work just fine. When you’re thinking about illuminating your pathways, walkways or driveways, you should definitely install some solar path lights. You need several solar lights and place them in line (if that’s the design of your pathway), guiding you the way in the dark night. Typically, their lights focus downwards so that is easier for you to see your steps. One great thing about the solar path lights is that they may also serve as solar accent lighting for your decks, patios or garden. There are many designs out there and you should choose according to the design of your décor. 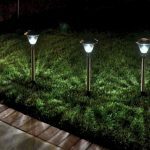 For a modern look, you may go with the solar lights with stainless steel poles with globes, whereas some lights that stake into the ground are always going to bring a magical feel to any pathway. Check the adjustability of your solar lights as many of them come with various lighting modes, that fit various atmosphere. The color of the light is also important and it’s a known fact that the colorful lights are effective for a fun or magical feel in your garden. But this doesn’t mean that some white lights shouldn’t be the best choice for your décor either. Pick carefully the place you’re installing the solar lights so that they get enough light during the day. Some diffused white lights can make magic on a pathway, but may very well serve as solar accent lighting on a deck. 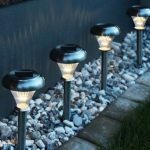 If you’re looking for some bright solar lights that are illuminating precisely the area you want, the task solar lights are the type you want to go with. You may mount this type of lights in various displays and you should be able to adjust them for an effective illumination of the area of your choice. Don’t be surprised if the solar panel of this type of lights is separated from the light source itself-it’s absolutely normal. This gives them amazing portability and versatility as you can put the task light where you need it and the solar panel in the most sun exposed space. We’re talking about the flagpole solar lights in this category that may have a gooseneck design so it’s not difficult for you to position it. You may also want to use some solar lights for your in-ground flagpole so you may want to go with some that are automatically turn on at dusk and remain so until the morning. You may find models with rotating arms which gives you the chance for the best setting and a 60 Lux output is enough for any flag. No matter which model you go with in the end, don’t forget about your security and ease of use. most solar task lights out there should be easy to install and you shouldn’t worry about your safety either. Spot lights are quite similar to the task lights are they’re typically brighter than other solar lights. They are versatile and you may easily mount them in many ways, according to your needs. The solar spot lights aren’t as bright as the indoor ones, but they’re pretty efficient also when it comes to illuminating an area of your choosing at night. The solar spot lights are very often used in security areas that need to be lit up with the help of motion sensors. This doesn’t mean you can’t use the solar spot lights for highlighting some special items from your garden décor in the summer time. What’s special about the solar spot lights is that they do cover a longer time covering than other solar lights. 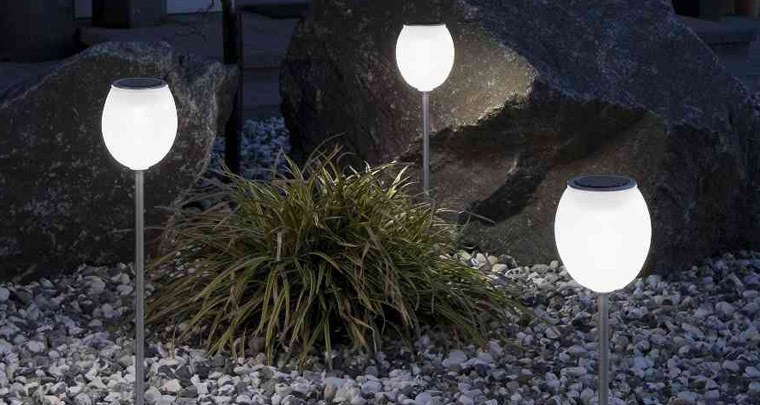 If you’re aiming for a nice glow on your landscape, the solar accent lights are the perfect option. The level of illumination of this type of solar lights isn’t high, but this isn’t why you got them in the first place anyway. Another thing to keep in mind when choosing your solar lights is that the taller they are, the larger the area of light dispersing is going to be. Many of the solar accent lights out there use amber LEDs, giving the soft glow that we mentioned before. You may confidently use from to bring some garden sculptures in the center of attention, or to highlight some specific landscape features or garden waterfalls. As they’re not that bright, you should go with more just one and get multiple lights closer to each other. The construction of your solar lights is also important and you should check not only the waterproof grade of the lights (the higher the IP grade, the better the chances to take more than a light rain), but also the materials the lights are made from. As you’re using them outdoors, they should present a sturdy build and should be made of good, long lasting materials. The quality of the photovoltaic cells has a lot to say when it comes to the brightness of your solar lights. The size of the LED bulb is also important, but both of these features come with a price. This brings us to our last piece of advice: the more you expect in terms of performance, durability, adjustability and versatility, the more you need to be willing to spend. How to Keep Troubleshooting Away from Your Solar Outdoor Lighting?